So, today’s lunchtime was spent ganking a Gobul. Which sounds a little rude. But it wasn’t. It basically involved swimming around a lot and stabbing it in the face even more. I’m finding the underwater combat really fun and satisfying – more so than in any other version. Mostly because of the ‘monster lock’ function. Underwater, with 360 degrees of movement on all axis, you can move really smoothly and simply by pretty much just using the lock button and evading in various directions. Anyway – the Gigul was pretty straight-forward to defeat (once I worked out the being behind him is only a good idea if you enjoy a very long paralysis). 50 minute quest with one objective. Kill a Qurupecu. 49 minutes later, I limp back to the village with no health, no potions, no whetstones, and proudly carrying a bunch of feathers. I’m going on a bear hunt! I’m looking for a scary one! As the song goes. Well, I certainly did find a scary one – he’s an Arzuros and his picture is down the bottom there. For this quest, I had to weaken him to a point where the tranquiliser would be effective. This involved wailing on him with dual-blades for a good twenty minutes. The trouble is, the animation is so flawless that it was kind of upsetting to do. Okay, at the start of the level he’s all drool and rage and swipey claws, but by the time I’d worn him down a bit he was limping from area to area and falling over when he tried to charge. Poor beastie. 1. Putting the hardware together, cabling up etc. 3. Spending two hours downloading an update. 4. Next up, I made a backup copy of my 3DS’s 32Gb memory card (and lucky I did – as you’ll soon hear). 5. Spent an hour doing a content migration from the Wii to the Wii-U. 6. Created profiles, added friends, stuck monster hunter in the drive. It’s all going to end in tears, isn’t it? So, I’ve not really been doing much gaming for the last year or two. Just fiddling with a few titles here and there. It’s a bit of a recurring ennui, really. I can pin-point pretty much where this lengthy slump came from. It pretty much coincides with the end of the Gamecube era and the start of the Wii era. Throughout its life, there was a steady stream of seriously good (to my eyes – I have odd tastes) titles appearing on pretty much a monthly basis on the cube. A fair few of them I still pull out every now and again. More than a few have gone in my gaming top-ten-of-all-time. So, to say I was disappointed with the Wii is an understatement. I’m sure there were some good titles released, but the sheer volume of utter shovelware pumped onto the system did a damn fine job of masking it. Even the first-party titles didn’t particularly shine for me (with a few exceptions). Something I’d normally consider unthinkable happened. Skyward Sword – a Zelda game – is sitting on my shelf. I haven’t played it. And I LOVE Zelda. Anyway, things appear to be looking up. I have a 3DS and it’s starting to get some damn good titles. Titles of a quality that it’s beginning to feel a bit like the Gamecube era. In the last six months or so I’ve bought Ocarina (again :)), Cave Story, Harvest Moon, Fire Emblem, Monster Hunter 3 Ultimate, Donkey Kong Country Returns and Luigi’s Mansion 2. Without exception, they are magnificent. 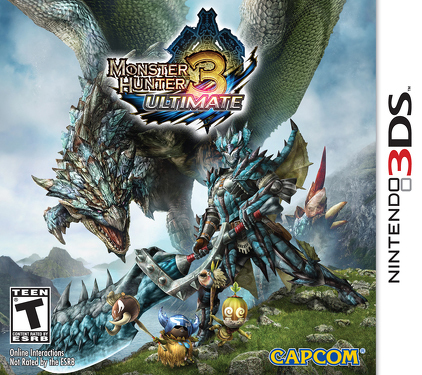 In fact, Monster Hunter 3 Ultimate is SO magnificent that I’ve just bought a Wii-U to play it on. Thank God, it looks like Nintendo are getting their act together. It appears dem monsters need hunting once again. I was a bit suspicious of how this would play, particularly with regards the camera, but as it happens it controls beautifully and doesn’t require The Claw Of Death like the PSP version did. So, it’s Monster Hunter – you know how it works. There’s Monsters. And you Hunt them. While upgrading and crafting and so on. It’s still got the learning curve we all know and love from the series, but that’s not a bad thing. It’s also very pretty. What is completely lacking, though, is standalone online multiplayer in the 3DS version. Given the PSP version (Freedom Unite) had it 5+ years ago, this is pretty bloody unforgivable. On the upside, those of us with a Wii-U (I don’t have one) can transfer saves to and fro between the Wii-U version (which DOES have online) and the 3DS. I don’t know what they omitted the non-local multiplayer. Seems a bit stupid. Still, the upside is it’s given me the reason I needed to buy a Wii-U. Anyway – it’s a diary, so progress. I’m just starting out. Ganked some Jaggia, collecting some mushrooms. Okay, so there seems to be some confusion about the title of this game. Sometimes GOD eater, sometimes GODS. Who knows what it actually is. In game, the team you work with are known as GOD eaters so we’ll go with that one. Regardless, the premise is simple. You kill ridiculously large monsters with ridiculously large swords and ridiculously large guns. There’s an amount of corpse-scavenging, an amount of crafting and the whole thing is designed for multiplayer. Sounds just like Monster Hunter, you cry. And you’d be right – it’s very like Monster Hunter. But with one important difference (well, two, but I’ll get to that); it doesn’t have the same brutally difficult leaning curve, particularly with regards to the controls. You can, to an extent, get away with flailing wildly at things in the early missions but you’d do well to learn to duck, weave and dodge. 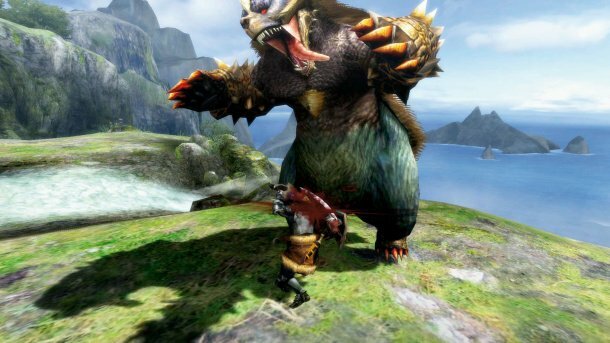 The difference is, God Eater Burst has fluid, fast and responsive controls and (in my opinion) Monster Hunterâ€¦ doesn’t. I’ve only played through the tutorials and 1st Tier missions, so I’m not hugely far in, but I have gone backhand replayed missions to improve my rank as well as to just try some things out and see what different strategies yield. All in all, I can see myself spending rather a lot of time with this one. This shouldn’t be possible. How can I be addicted to a Harvest Moon game again? They’re all the same (more or less) and yet I’ve been addicted to every single one of them. 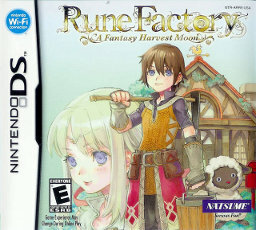 Rune Factory, though, is a wee bit different. Kinda. Sorta. You’re still put in charge of a farm. You still grow crops, upgrade your house, make friends, get married, raise children and all that other lovely Harvest Moon goodness. Except they’ve added dungeons. And monsters. And levels. And stats. And more OCD-triggering collectibles than you can shake a stick at. In short: I’m doomed. After doing a fair bit of ploughing and preparing the ground, I was given a pass for the first cavern system (which, incidentally, you can plant crops in and which stay the same season! Handy!). Sadly, I almost got ganked by a monster as soon as I went in, and if your HP falls to zero, you die. Not good. So I ran away. I’ve also done rather a lot of fishing. There’s something deeply relaxing about it. So – plan B. I’m going to leave the caves alone for the first year, at least until I can afford some decent gear.